The policy implication for today is that the Fed should consider raising its target interest rate soon or face the prospects of lower inflation. Given this view's reliance on the Fisher relation, Noah Smith has called this group the Neo-Fisherites. Smith, himself, acknowledges being lured by the siren calls of Neo-Fisherism. It is all so elegant and straightforward, so why not? There are two reasons to be leery of Neo-Fisherism. First, it ignores Wicksell's cumulative process. This idea says that if the central bank pegs the short-term nominal interest rate below the natural interest rate the price level will eventually explode and vice versa. The Fisher relation is an equilibrium condition and says nothing about this disequilibrium dynamic. Rajiv Sethi and Nick Rowe note that once one acknowledges the potential for the Wicksellian cumulative process, it becomes apparent that the Fisher relation itself is not necessarily a stable equilibrium. These concerns are why the Taylor Principle is such a big deal in macroeconomics. Second, Neo-Fisherism has been tested in the real world and failed. There are several historical experiences where monetary authorities pegged short-term interest rates for an extended period and they did not end in deflation. Also, there are other more recent experiences that raise doubts about Neo-Fisherism. Let's take a look at them. I think that it is important that in monetary models there are typically two equilibria -- a monetary equilibrium and a non-monetary equilibrium. The assumption that the economy will end up in a rational expecations equilibrium does not imply that a low nominal interest rate leads to an equilibrium with deflation. It might lead to an equilibrium in which dollars are worthless. I'd say the experiment has been performed. 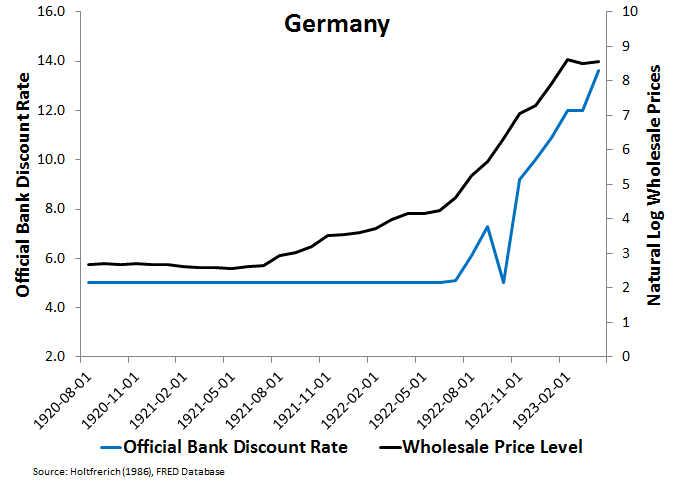 From 1918 through (most of) 1923 the Reichsbank kept the discount rate low... and met demand for money at that rate. The result was not deflation. By October 1923 the Reichsmark was no longer used as a medium of exchange. 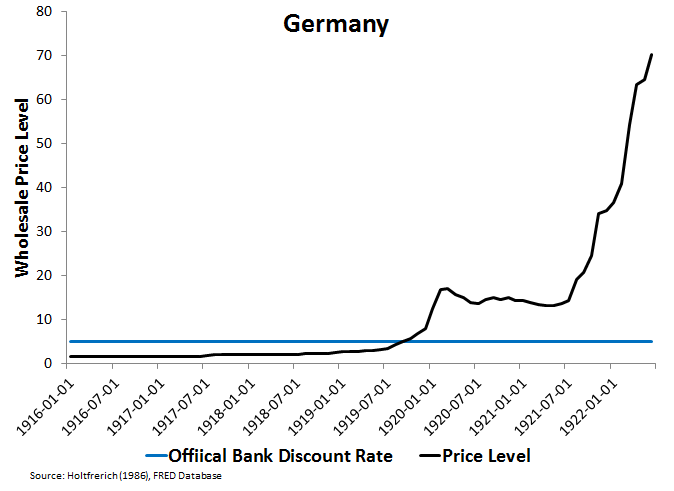 The Reichsbank pegged its official bank discount rate at 5% from 1915 through 1922. That is long enough to test the Neo-Fisherite view. The Figure below shows what happened: an explosion of the price level. The next figure goes through 1923 where the price level really takes off. Here I put the price level in natural log to make the graph readable. 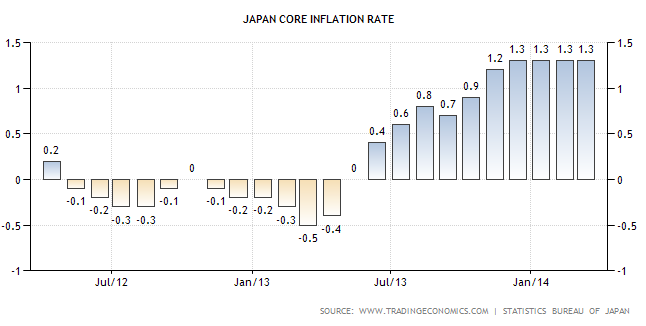 Note that eventually the explosive inflation is followed by a rise in the nominal interest rate. So this experiment shows (1) a central bank pegs an interest rate too low for an extended period, (2) inflation begins to surge, and (3) the pegged interest rate is eventually forced up. This is the causality laid out in Wicksell's cumulative process. Strike one for Neo-Fisherism. From April, 1942 to March, 1951 the Fed pegged interest rates to help the government's financing of World War II. Treasury bills were pegged at 0.375% while long-term bonds were set at 2.5%. During the war this arrangement was tolerated (and aided by price controls), but with the end of the war the Fed was eager to get out of this "straightjacket" as inflationary pressures built because of the Wicksellian cumulative process. This can be seen in the figure below which goes through 1948. By February, 1951 CPI growth at annualized rate reached about 20%. A few months later the famous Treasury-Fed Accord was signed that gave the Fed independence. The figure below shows the struggle the Fed was facing between the end of World War II and the Accord. The Wicksellian process was unfolding and the Fed sorely wanted to raise interest rates enough to stem it. Here too we see (1) a central bank pegs an interest rate too low for an extended period, (2) inflation begins to surge, and (3) the pegged interest rate is eventually forced up. Strike two for Neo-Fisherism. Canada Over the Past Twenty Years. Strike Three for Neo-Fisherism. If they had not already struck out, I would also pitch Abenomics at the Neo-Fisherites. It is still a work in progress, but the evidence so far should give Neo-Fisherites pause. The point of these examples is that history is filled with many examples of monetary policy regimes that violate Neo-Fisherism. In fact, it is hard to come up with examples that unambiguously fit the Neo-Fisherite view. For example, some proponents point to Fed policies and the low inflation rate over the past few years as evidence for Neo-Fisherism. However, there are empirical studies that show QE has actually raised inflation in the United States. And arguably, the reason the Fed's programs have not packed more of a punch is their temporary nature. In short, there is little solid evidence for Neo-Fisherism while there is much for the conventional view. So be very leery of Neo-Fisherism. The argument he was making was essentially that if the Federal Reserve chose to leave the interest rate at zero for an extended period of time, this would imply that eventually they would have to pursue a policy that was deflationary. If they didn’t pursue that type of policy, they couldn’t maintain their peg of the nominal interest rate. In addition, since we don’t expect the Federal Reserve to pursue a policy consistent with negative rates of money growth, the statement should be seen as a criticism of the Federal Reserve’s original attempt at forward guidance which suggested that the FOMC would keep the interest rate at zero for an extended period of time. If only that had been made clear sooner! Is it not the case that in the German and US examples that had the CBs been serious about maintaining low interest rates (and had a better understanding of the Fisher equation) they could have done so by targeting a rate of deflation equal to (natural rate - target rate) ? This may have caused an initial bout of high interest rates but eventually deflation and interest rates would have stabilized at the desired levels. Rob, if by low interest rate you mean 0% (so that inflation = - real natural rate) and assume a long-run equilibrium (away from short-run shocks) then it is theoretically possible. In fact, that is Milton Friedman's optimal quantity of money rule. However, no central bank has ever implemented it and its hard to believe they could have done so back then. You say... "The Fisher relation is an equilibrium condition and says nothing about this disequilibrium dynamic." Here is a post that I wrote explaining how inflationary pressures can make the Fisher Effect stable or unstable. One could realize that inflationary pressures were much stronger in the Weimar Republic. 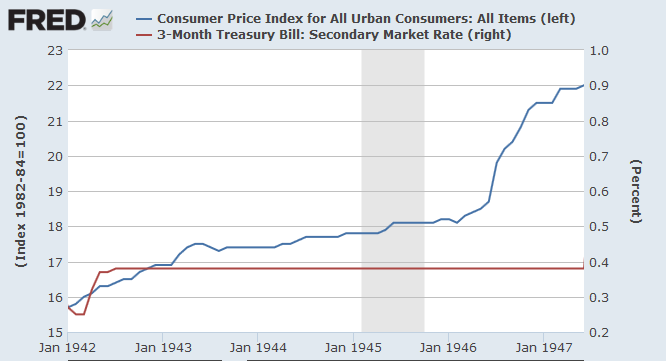 As you say also, inflationary pressures built in the US after WWII. Currently, inflationary pressures are being muted. Big difference for the autoregressive coefficient that I talk about in my post. Oops, meant as a reply to your comment on Friedman's optimum-quantity-of-money (above). David, great post. How about what's happening in Sweden? Could that be "strike four?" "And arguably, the reason the Fed's programs have not packed more of a punch is their temporary nature." It seems that in at least *some* significant quarters, people were not really thinking it was so temporary. Can we infer that from the chart Marcus posts there? And yet their expectations were wrong over and over again. Do you have anything to add to Marcus' explanation? I'm so fascinated by that chart because I never considered that somebody had quantitative data on expectations! ... Perhaps that's nothing new to you, but for an amateur like me that's the first time I've seen expectations data presented in a striking way like that. I realize that we're not comparing the same things here: you mean expectations that base money injections are permanent, and Marcus' chart shows expectations of short term interest rates... but it still seems strange that those expectations kept coming up "they will take off into the sky any day now!"..... for years!... and yet it didn't happen. The base money was there to make those expectations come true, no? Tom, note sure this will be a complete answer but here goes. First, note that all their forecast only have the federal funds rate returning to 1-2.5%. That is still far below the normal 4-5% associated with robust growth. So their forecasts don't imply expected growth to be high. Second, the economy does not need the Fed to heal. It could return to full employment on its own. So even if the Fed's action are understood to be temporary and therefore ineffective, the forecasters might be forecasting some 'natural' healing process. Of course, these forecast are anemic as pointed out above so the natural healing isn't all that. Good thorough post David. Pictures always help too. "Why didn't inflation fall further than it did when economies hit the ZLB? I don't know." Thanks Nick. I have learned a lot from you! Nick, any guesses (beyond what Krugman has postulated)? Also what do you think of Edward Lambert's post that he references here? I'm surprised that Sadowski or somebody didn't leave a long comment over there... I don't know what they'd say, but I thought there'd be some kind of response. Thanks for the update from Josh Hendrickson. That helps everybody. I appreciate Steve Williamson. I think he is right. The Fed feels more comfortable with inflation below target than above it. The Fed feels more comfortable with moderate inflationary pressures. And M. Friedman saw that persistently low nominal rates would eventually imply deflationary policies, which turn out to be conducive to a stable Fisher Effect. The result is that inflation is sliding downward, but it is not clear yet how low it will go. Inflationary forces could increase or decrease. "Forget about forward guidance. You've pretty much blown that, by moving from "extended period" language, to calendar dates, to thresholds, and then effectively back to extended periods. That's cheap talk, and everyone sees it that way. So, as long as the interest rate on reserves stays at 0.25%, there are essentially no benefits in terms of more real economic activity. But you're losing by falling short of the 2% inflation target, which apparently you think is important. And you'll keep losing. So, what you should do is Volcker in reverse, except you don't have to move the inflation rate up much. For good measure, do one short, large QE intervention. Then, either simultaneously or shortly after, increase the policy rate. Under current conditions, the overnight nominal rate does not have to go up much to get 2% inflation over the medium term." That is not a thought experiment. Williamson literally thought that raising interest rates would boost inflation! Of course there would be a short-term reaction to raising the Fed rate. My view is that Mr. Williamson was giving an option of how to ameliorate that short-term reaction. There are other options. But all in all, raising the Fed rate is risky. How many people would even know why the Fed is raising the rate? How many of those people would even understand the Fisher Effect? And of those people, how many would actually accept the reasoning? Not many in the long run... So we should not expect the Fed to raise the Fed rate. The goal is to understand the dynamics of low inflation. Unless he also raises the reserve requirement to remove all the excess reserves (more than 100%! ), or enough of them anyway. The only other way, with lots of excess reserves out there, is to ditch 1. and raise IOR. What am I missing? Yes, economists most often use the natural log transformation. David, based on your link to Josh's article above, are you saying this whole "Neo-Fisherite" thing, going back months now, has all just been a big misunderstanding? What's missing in many of these episodes, especially Weimar Germany, is nominal public spending. Hyperinflation is always and everywhere a case of extremely rapid nominal public spending growth (usually in a desperate effort to maintain real public spending despite a collapse of real revenues). The central bank plays a supporting not driving role, financing as much public spending as it's asked to finance. No central bank ever created hyperinflation merely by stimulating private lending. And supplemented by the IMF World Economic Outlook, the World Bank (WB), Michael Bordo’s financial crises database, and AMECO. These are nations and years in which hyperinflation occured. All fiscal balances are as a percent of GDP. The median fiscal deficit on this list is 6.8% of GDP. To put this into perspective there are 19 deficits listed in the MHFPP database larger than the largest deficit on the above list: 1) the UK from 1915-18 and 1941-45, 2) Italy from 1915-17, 1942 and 1944, 3) Finland from 1940-41, 4) Greece in 1898, 5) the US in 1943, and 6) Ireland in 2010. So although fiscal deficits tend to be much larger than average during hyperinflations, large fiscal deficits are neither necessary nor sufficient to cause hyperinflation. Mark, Bernholz said it takes large debt and deficit. I would add that people need to give up on there ever being a balanced budget. During a war deficit spending is not so bad because after the war the Military will be cut back and the deficit can go away, as with USA after WWII. So to me the current Japanese debt and deficit is far worse than the US during WWII as there is no real hope of fixing the deficit. In your list of 19 large deficits, a number of these are during a war so similar to the US WWII situation. Do you know if there were non-war cases or cases with high inflation but not 50% per month? Oh, and in general a large temporary deficit does not cause hyperinflation since you need a large debt as well. In your cases, how many had debt less than 100% of GNP? I excluded all Israeli deficits (seemingly always at war). So neither a high deficit, nor a large public debt, is necessary to cause hyperinflation. True, the median debt among the 19 hyperinflation incidents for which there is both fiscal deficit and public debt data is 145.8% of GDP. But recall, the list of high debt incidents (100% or more of GDP) without hyperinflation is extremely long, with many well over 200% of GDP. Once hyperinflation starts the existing debt quickly becomes small compared to the nominal GNP. So what we really should look at is debt and deficit levels before the hyperinflation starts. Can you do that? True, Brazil was running double digit deficits in 1985-89 and its debt reached 102.9% of GDP in 1989, the first year of its hyperinflation. Bulgaria had a deficit equal to 8.0% of GDP in 1995 and one equal to 10.1% of GDP in 1996. And it's public debt ranged from 104% to 290% of GDP in the five years previously. But Argentina ran fiscal supluses in 1985 to 1987 and had a deficit equal to only 1.5% of GDP in 1988. Public debt only ranged from 56% to 73% of GDP in 1985 to 1988. Similarly, Peru's deficits were only in the range of 2.4% to 6.3% of GDP in 1985-87 and its public debt was only 39% to 63% of GDP in those same three years. Zimbabwe's deficits were 6.4% of GDP in 2005 and 2.5% of GDP in 2006. It's public debt was only 48.6% of GDP in 2005 and 57.6% of GDP in 2006. In my opinion Bernholz bases his generalizations concerning hyperinflation on an extremely small subsample of predominantly European nations. Places that have been recently bitten by high inflation are far more sensitive to the possibility and don't seem to let things go as far before fleeing the currency. South America seems to have hyperinflation more often than European nations so the "breaking point" generalizations should be very different (much lower Debt/GDP). Part of what I like about the 26% per year cutoff for "hyperinflation" is that we would have far larger datasets to generalize from. If you say 50% per month you really have a small subsample of the problem. The other thing is that you can get hyperinflation just by having the government rob the central bank of its reserves. Argentina seems to do this but I don't remember any of Bernholz cases working this way. Vincent, what do you mean by "reserves" in this sentence? "The other thing is that you can get hyperinflation just by having the government rob the central bank of its reserves." Going back several years, Nick's description of the Wicksellian cumulative process always made sense to me at an operational level. "The argument he was making was essentially that IF the Federal Reserve chose to leave the interest rate at zero for an extended period of time, this would IMPLY that eventually they would have to PURSUE a policy that was deflationary. IF they didn’t pursue that type of policy ..."
Yes - this useful clarification to say the least. I appreciate your work. 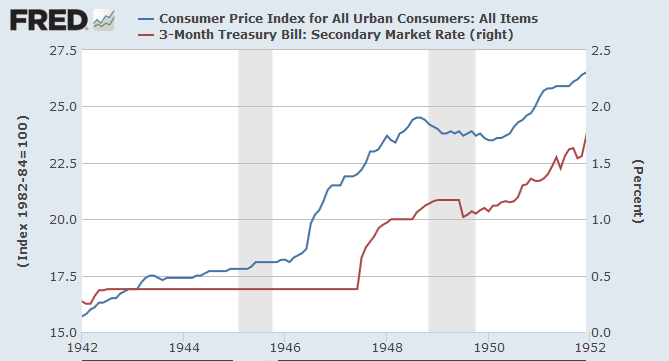 Just want to add here that I wrote a post today about Inflation decaying. The part I would like you to see is the model that I briefly give at the end of the post where inflation reacts to proactive nominal rate moves, but then if nominal rates go passive, like they do at the zero lower bound, then the ADL model shows that inflation can go into a decay process if inflation inertia is low. A low autoregressive coefficient on inflation would reflect low inflation inertia. Then the Fisher Effect becomes stable.